Union Valley Reservoir was built in 1963 by the Sacramento Utility District (SMUD) as part of a complex network of diversion tunnels and power plants designed to provide peak power during times of heavy electrical use in Sacramento. SMUD owns and operates the reservoir along with the campgrounds and facilities around the lake in cooperation with the USFS. There is a 5 ½ mile paved trail along the east side of the lake, for bikes and hikers, that connects to the campgrounds. Logging roads around the lake also offer many more miles of unpaved trail travel. (Nearby Big Hill at 6000’ elevation offers a great view). The lake, at 4855 feet elevation, is contained behind a 450 foot high dam. SMUD tries to keep Ice House Road plowed all winter long, which gives access to Union Valley all year. Water to the reservoir flows through a clever system of tunnels that brings water from Loon Lake and Ice House Reservoir and adds it to the natural waters coming in from Tell’s Creek and two forks of Silver Creek. Directions: Go 23 miles east of Placerville on Highway 50 and turn L on Ice House Road (FS 3), then go 14 miles north to the Jones Fork Campground. There is a parking lot there. The paved trail starts near the campground and winds its way along the east shore with rolling terrain for bikes or hiking. Besides the parking lot at Jones Fork you can find a parking lot further north along Ice House Road at the Big Silver group CG. It is also possible to ride logging dirt roads all around the lake, take FS 12N78 towards Yellowjacket to access the north side. History: Long ago before anyone probably thought about building a reservoir here, the “Virginia City Road” came along the northern side of what is today the lake, and connected the Georgetown area to the silver mines of Virginia City. This route (today) traverses Sierra Pacific Industry (SPI) logging lands once it leaves Wentworth Springs Road, and until it reaches the area of the reservoir. 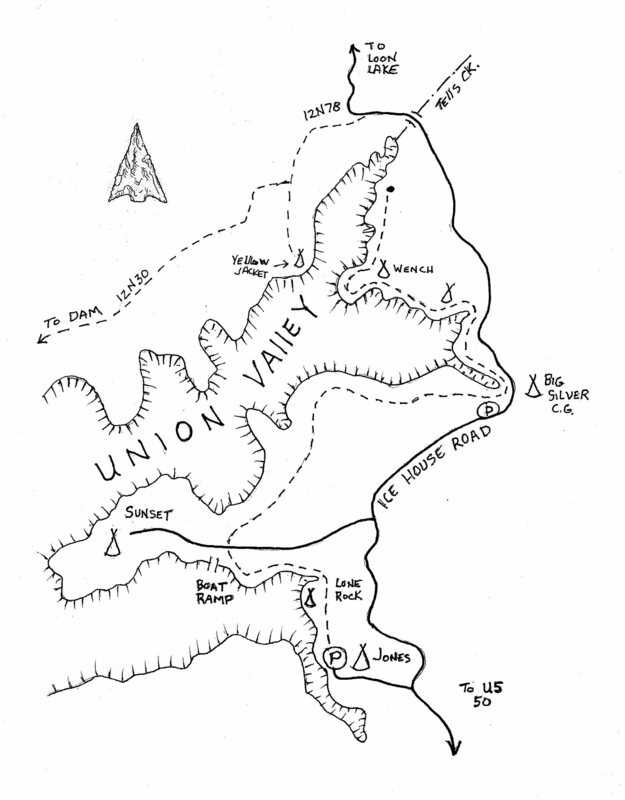 (from the map of Amos Bowman, 1871).